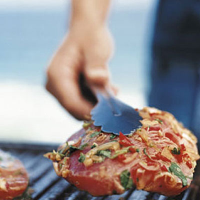 Lime, garlic, lemon grass, chilli and coriander add real zing to succulent tuna steaks. Reserve a small handful of coriander for the garnish and roughly chop the rest. In a small bowl, mix the chopped coriander with the remaining marinade ingredients. Season with freshly ground black pepper. Using your fingers, rub this mixture over the tuna steaks. Place in a non-metallic shallow dish and leave to marinate for 15-20 minutes. Preheat the barbecue or an oiled griddle to medium-high. Cook the tuna steaks for 3-4 minutes on each side. Garnish with coriander leaves and serve with lime wedges.